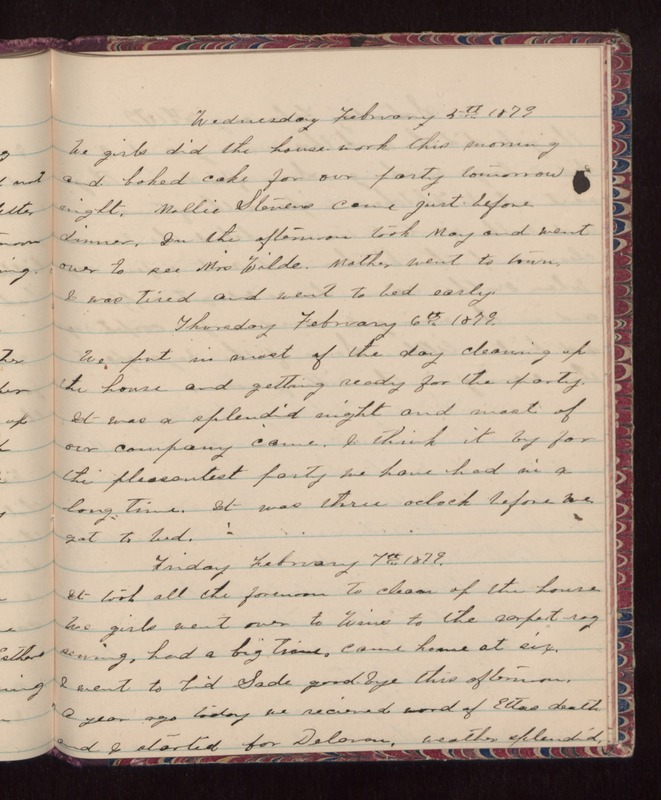 Wednesday February 5th 1879 We girls did the house-work this morning and baked cake for our party tomorrow night. Mollie Stevens came just before dinner. In the afternoon took May and went over to see Mrs Wilde. Mother went to town. I was tired and went to bed early. Thursday February 6th 1879. We put in most of the day cleaning up the house and getting ready for the party. It was a splendid night and most of our company came. I think it by far the pleasantest party we have had in a long time. It was three oclock before we got to bed. Friday February 7th 1879 It took all the forenoon to clean up the house. We girls went over to Wins to the carpet rag sewing, had a big train, came home at six. I went to bid Sade good-bye this afternoon. A year ago today we recieved word of Ettas death and I started for Delavan. Weather splendid.